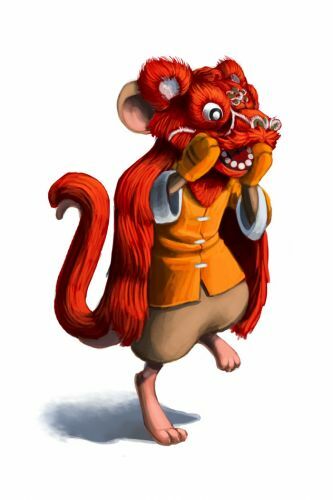 The Costumed Tiger Mouse is an Event Mouse found during the annual Lunar New Year event. Usually, there are two mice who dance in this costume for the New Years parade, but this year the mouse that holds up the back end of the tiger costume was sick. So, its partner gets to have all the fun, dancing in the parade, eating all the candy, nearly getting squished by a multitude of Onyx Mallet traps set out by hunters. . . On second thought, maybe the sick mouse was the luckier partner after all. Information on how to locate and capture the Costumed Tiger Mouse can be found on the current Lunar New Year location page. 9 February 2010: The Costumed Tiger Mouse was released as part of the Heart of the Tiger Party event. The amount of gold (888) awarded on catching a Costumed Tiger Mouse reflects the belief of the number eight being considered "lucky" in Chinese culture; a sequence of a "lucky" number is considered even more favorable! This page was last edited on 8 February 2016, at 21:21.